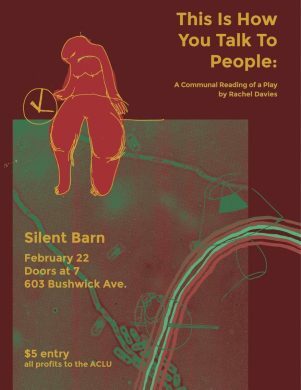 Tonight, Bushwick mainstay The Silent Barn will welcome a “communal reading” of a play by Rachel Davies, who has written for outlets such as Rookie, Complex, Nylon, and The Le Sigh. This Is How You Talk To People is Davies’s first play, and chronicles a variety of women from a talk show host to a student who are collectively trying to navigate shifting friendships and relationships. The reading will be done communally in “an attempt to make the performance more accessible,” and profits from the evening will be donated to the ACLU.